Both of these worksheets help students organize and analyze the settings and conflicts of Roll of Thunder, Hear my Cry. The setting worksheet asks students to describe both physically and emotionally the 6 settings that appear in the novel. 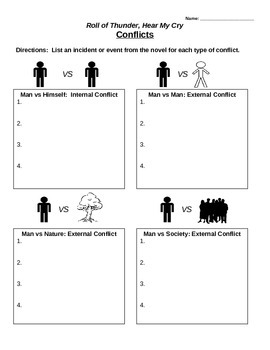 The conflict worksheet has students find conflicts in the novel and identify the type of conflict that it is. Both of these worksheets can be completed at the end of the novel or they can be completed as students read. If you like this product, see my other activities for Roll of Thunder, Hear My Cry.